Rambles and Ruminations: Five Alive! 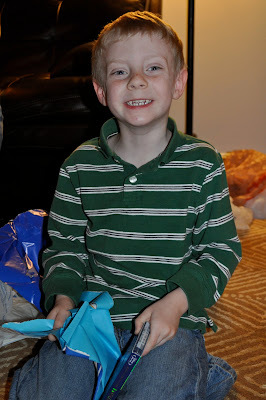 Caleb had a birthday this weekend and now he is 5! Every parent should be lucky enough to have a first child like Caleb. He is smart, obedient, tender-hearted, generous, energetic, and kind. He is such a great kid, I routinely have to remind myself to be more patient with him because he is, in fact, just a kid. Caleb is very curious about everything and loves to learn. He never stops asking questions or trying to figure out why things are the way they are. He has a memory like a steel trap. His teachers at school and church are always praising his good behavior and willingness to participate. Caleb loves music and movies and playing games (computer, board, video, etc.). He loves trains and dinosaurs and rockets. He never gets tired of watching airplanes land and take-off and is constantly asking us when we are next going on an airplane. He's a great traveling companion, especially because he is always happy to pose for pictures. Caleb delights in almost everything and every day with him is joyful and fun. He is rarely sick and when he is he's a pretty good patient. He loves his little brother and is very patient with him. Caleb will eat almost anything. He is always up for doing something fun and I love that he thinks visiting monuments and museums falls into that category. From the moment I found out that Caleb was coming to our family I knew he was a very special soul and the last 5 years have only made that more apparent. Caleb made me a mother and every day makes me grateful that he did. Happy Birthday Caleb! Sorry I am a lame auntie who never remembers birthdays. We love you and miss you lots! Happy Birthday Buddy! I cannot believe that you are so big! 1800+ days, Wow. That is a lot of living! Um, hi Linsey. I guess I follow your blog. I have a bunch of state department blogs I follow, and when I read yours just now, I realized with all the mention of Caracas, Beijing, and all that, hey! You're the Linsey I met at the party on Friday! Happy Birthday to your wonderful Caleb. What a glowing tribute to him. He is really special...and darling to boot. I love how you included a picture for all 5 years of his life. I actually got a little teary when I read, "Caleb made me a mother and every day makes me grateful that he did." So perfectly and sweetly put. Happy Birthday to Caleb! I am lucky to have a first child named not only Caleb but sounds just like your Caleb too. Lucky moms!